So this vacation I went to my hometown. And I ate a lot of sweets & now I’m regretting that I’ve put on weight 2-3kg. Well apart from this I’ve enjoyed a lot. 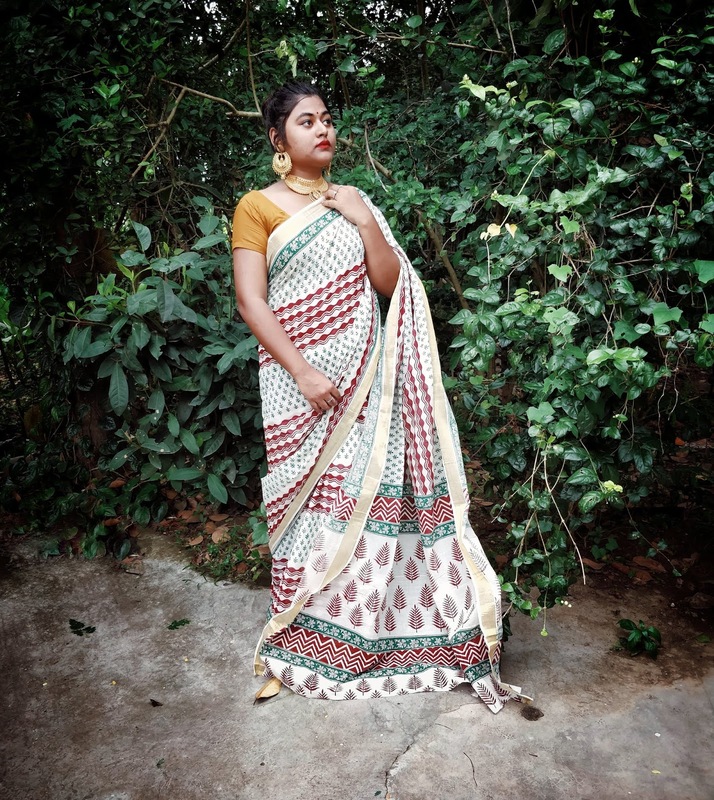 Also today’s post is about saree. Excited much? The pictures you’ll see in this post is styled by my grandma. 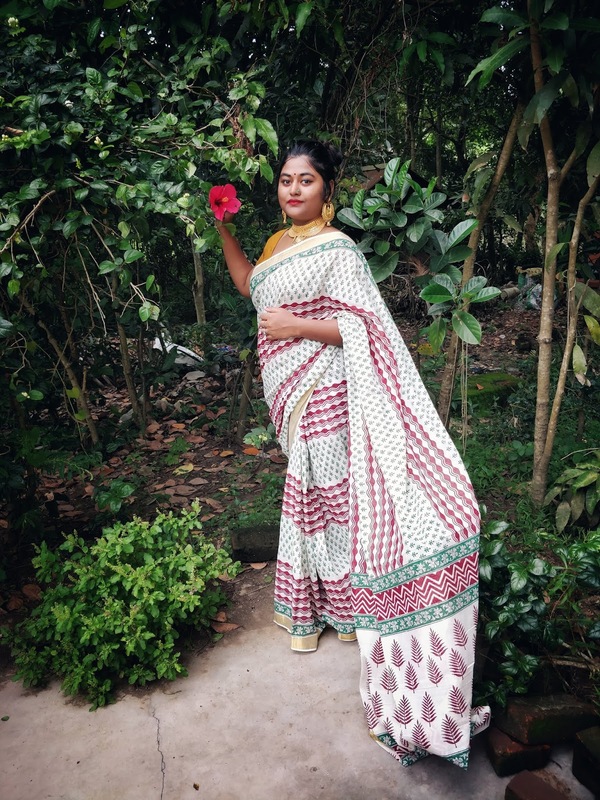 Being a Bengali I adore this 6 yards beauty or sometimes 9 yards. 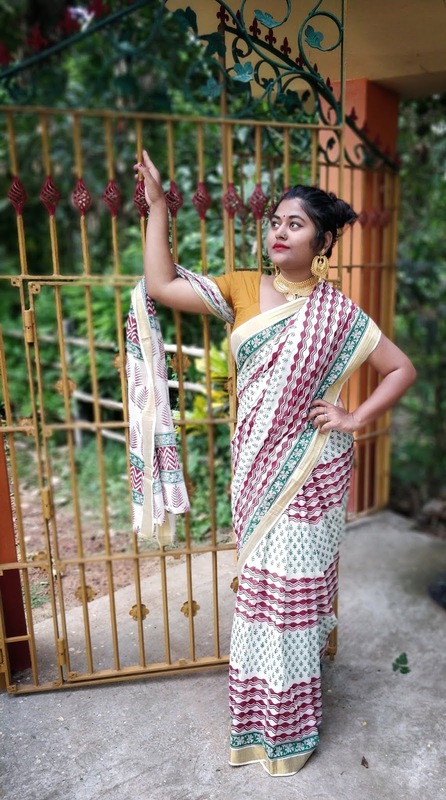 I love the fact about sarees that each sarees tells a different story. 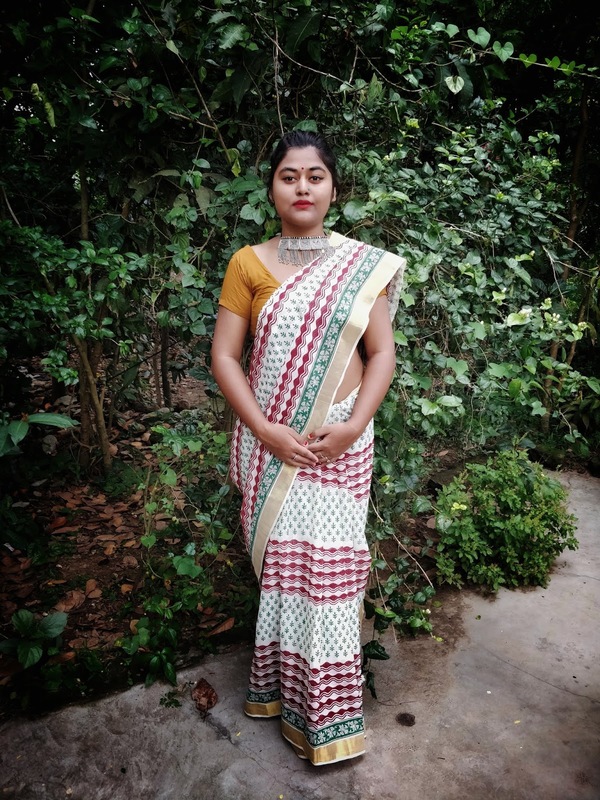 Here I’m wearing a Kerela Cotton Saree . The Kerala Cotton Saree woven from unbleached cotton or Kora cloth and with golden Jari border with motifs of animals, birds, peacocks, flowers, fruits and leaves is highly popular. 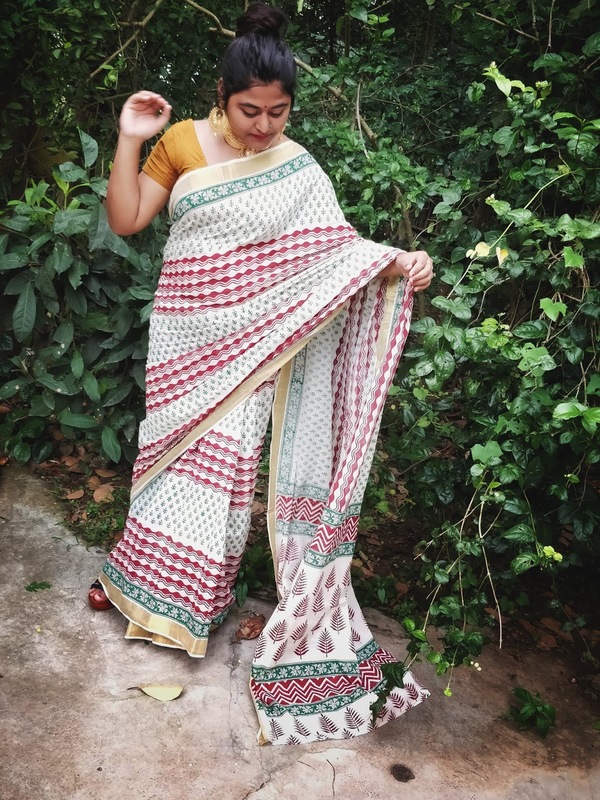 Adding style also to the handloom cotton sarees are motifs of checks and stripe patterns on wooden block prints using vegetable dyes. Interesting right? Told you every saree tells a different story. 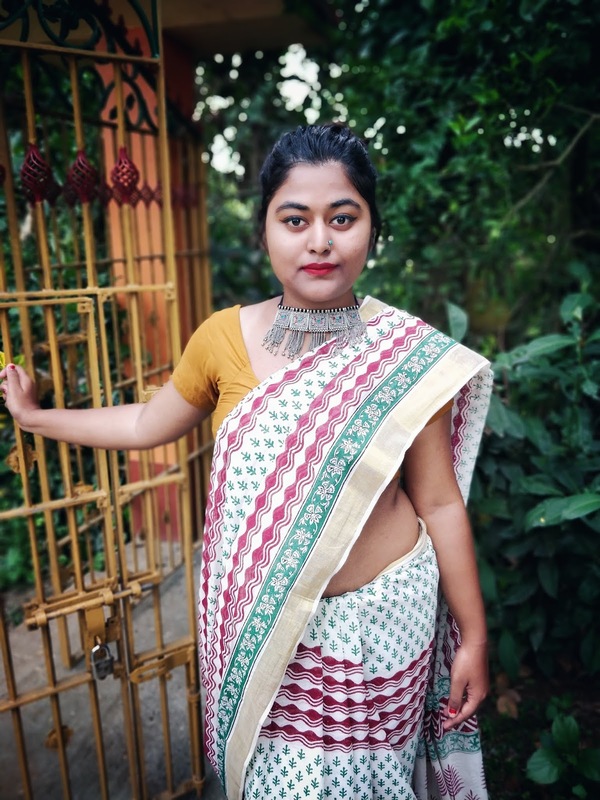 This saree I’m wearing is from Unnati silks. 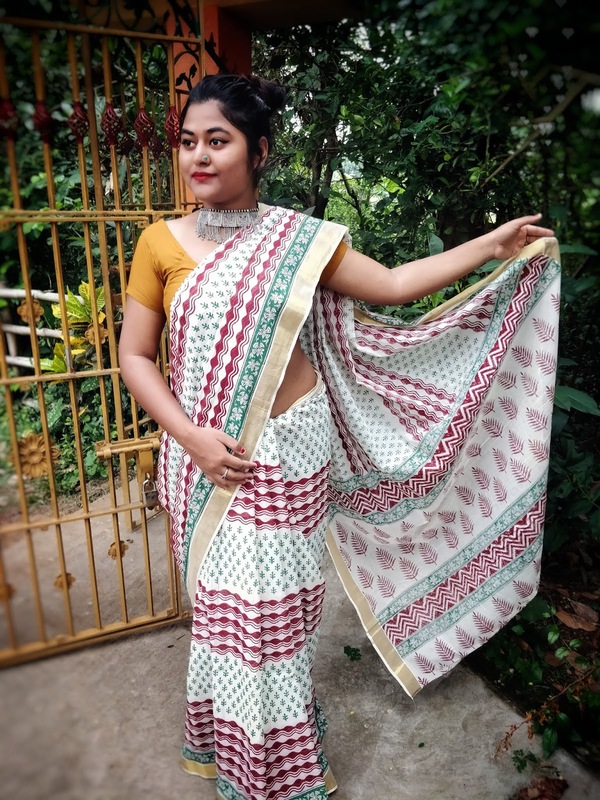 It is a largest ethnic online Indian shop offers exquisite designer Kerala Cotton sareeswith matching blouse for sale. The Online shopping store has the widest range of ethnic Indian Sarees online and Salwar Kameez online. 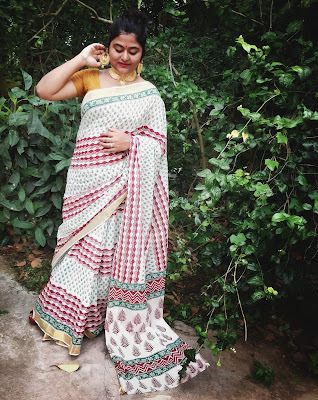 At Unnati Silks, you can buy online unique, fancy, exclusive collection of Traditional, Wedding, bridal attire, stylish, party, trendy fashion, formal, corporate, office, daily casual saris in pure silk sarees, pure cotton sarees, sico, art silk georgette, chiffon, dupion, tussar, organza, crepe, gicha, jute and other fabric varieties at attractive prices. That’s very interesting that each one has a meaning. I always wondered that! I love all the colors! site and in accession capital too assert that I get in fact enjoyed account your blog posts. sarees are love, you’ve carried it so well. Loved this saree ! You are looking so beautiful in Indian attire!